Recently Red Line Synthetic Oil Corporation mailed an article to AMSOIL Dealers outlining results of testing done on AMSOIL Series 2000 Synthetic 20W-50 Racing Oil and Red Line products. AMSOIL finds the article flawed in both its marketing approach and scientific methodology. 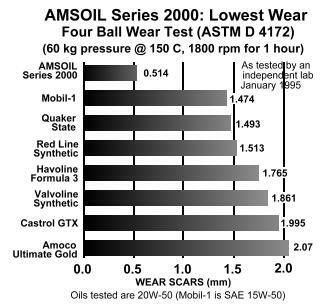 Initial Red Line testing of an unused sample of AMSOIL Series 2000 20W-50 Racing Oil in the ASTM D4172 Four Ball Wear Test yielded results consistent with those appearing on the Series 2000 label. That is, AMSOIL Series 2000 20W-50 provided nearly three times better wear protection than Red Line 20W-50. The article, however, goes on to report results of used oil testing using the ASTM D4172 Test. ASTM tests, as any informed entity in the lubricants industry knows, are designed for use with new (unused) lubricants, not used oil. There are two problems with testing used oil. First, the conditions of testing are uncontrollable. While Red Line states the service conditions under which the samples operated were the same, variables including fuel and glycol dilution, contaminant levels, filtration, driving conditions sampling techniques and many more are virtually impossible to control. The second problem is repeatability, AMSOIL attempted to replicate Red Line's findings by testing samples of used oil. The results were inconsistent with Red Line's and failed to meet the repeatability requirements of the ASTM D4172 test method. This failure is the result of testing an oil along with its contaminants. Red Line's claim that their oil is designed to become more effective as it reacts with blow by gases is absurd. Clearly, if blow by gases improved the anti-wear characteristics of lubricants, then lubricant manufacturers would expose their products to such gases during the manufacturing process. The fact is, lubricant performance should not depend on the uncontrollable reactions of blow by gases with the oil.